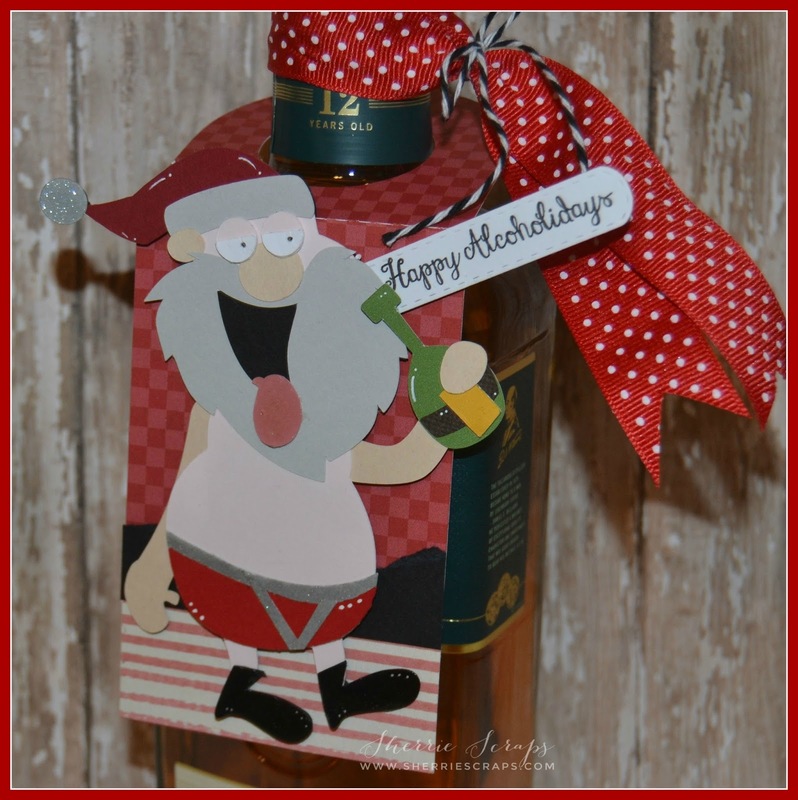 Sherrie Scraps with passion: Happy Alcoholidays! Wow! I can't believe it's 2016! I hope this year doesn't go near as fast as last year did, yikes! I am hoping to accomplish a lot this year...at least I have good intentions right now, lol! I am working on purging and organizing my craft room a bit better this past week. My cabinets are in with the exception of one section that had to be re-ordered, boo! I should have them in about 10 days. So, in the meantime I am working on getting things back in place. I can't believe how much I have...I have even found things I didn't even know I had! The sentiment is stamped with Jaded Blossom~Bah Humbug stamp set....perfect for this topper:) A little doodling and wink of stella for a shimmery look. I finished by tying on some fun polka dot ribbon and twine from my stash. 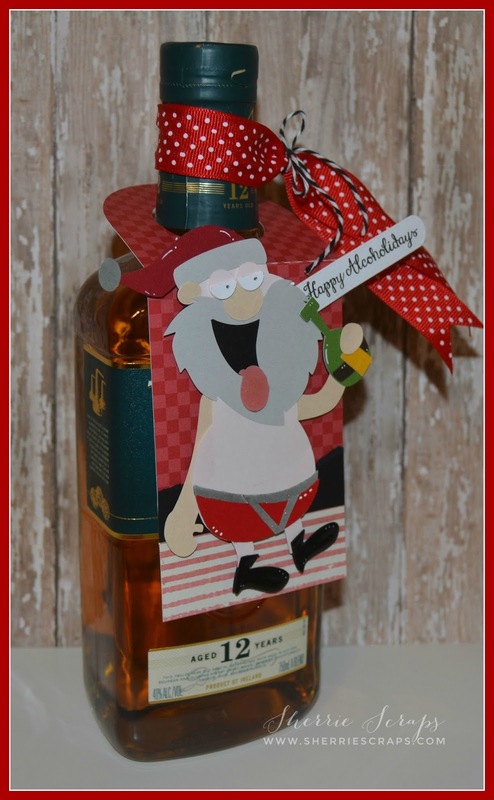 This is so stinking cute , what a cute way to give a gift, adorable! Thanks for playing along over at DL.ART! How fun is this bottle topper! Happy New Year Sherrie! What a fun and cute project! :) Thanks for the laugh! 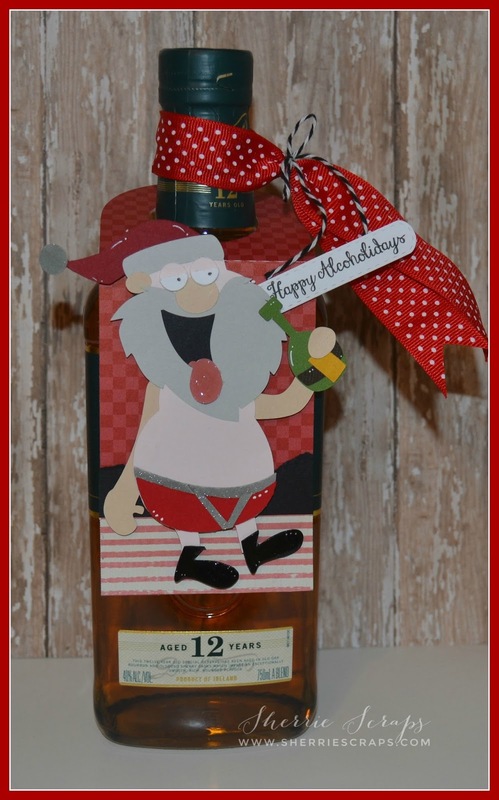 This is soooo CUTE & Such a FUN Image Sherrie! I know how purging & reorganizing can be - and I'm actually getting ready to start doing the same thing - I have tons of 12 x 12 paper that I'm just never ever gonna use - so I've decided to get rid of it this year and hopefully in the next couple of months - I'm hoping to sell some to my crafty friends around here - I figure 100 sheets for $10 should help to get rid of the stuff- then I can reorganize my 6x6 pads.... My Stamps have been done in the past, but I got new ones for Christmas, so need to get those done too.... Lots of work! :) Hope you get yours all done soon! Have a great weekend! This is so fun! I bet your friend loved her/his version! So fun! Happy New Year! Such a super fun topper!! The Santa is hilarious!! Very cute, hope your friend enjoyed it. Thank you for joining us at Silhouette Challenges. What a Super cute and FUN project!!! The Santa is fabulous!!! Oh my gosh, how fun is this Santa?! What a fun gift. I have been working on my studio also, but it sure it slow going! I am always so reluctant to get rid of anything ...just in case! Good luck with everything and be sure to share pics when you're all done! Happy New Year! Such a fun project, that Santa is just the cutest! I wish I had the motivation to organize my craft room, it just work around the junk, haha! Happy happy New Year Sherrie !!! I hope you have a wonderful and amazing year my friend !!! Wow , I can imagine you can't wait for your room to be complete ! I should do that also ( I can only imagine the things I will find from when I starting this lol ) ! Your Santa is so fun , he goes perect on the tag !! How FUN! This is so CUTE! This is so cute! I love his cute undies too! OMG still laughing here. This is just too cute. Love it my friend. PDE Linky Party~Have a Beary Special Day!